**** Chosen by Winner: Brain B. Each year Spartan Blades makes four Special Edition Spartan Harsey Folders. We think the name of this blade say it all! 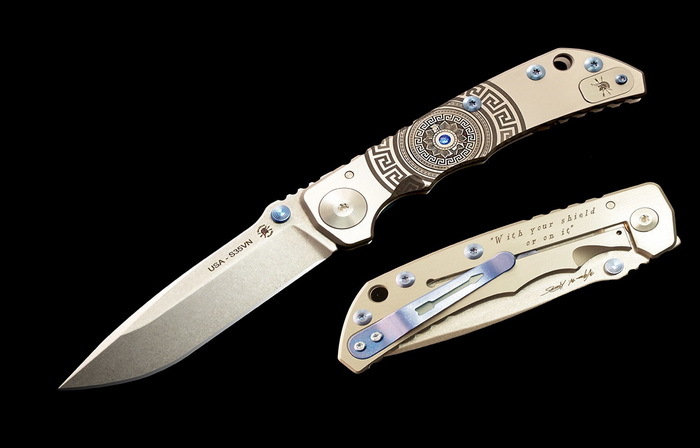 Designed by prolific knife maker William W. Harsey Jr., the Spartan Harsey Folder (SHF), is the knife many of you have been waiting for! A reliable frame lock knife, that except for the pivot, blade and stop pin is totally made of 6AL-4V titanium. This quality folder has a reversible pocket clip and dual thumb studs allowing for our left-handed friends to be accommodated. It is an ideal tool for anyone that appreciates quality! A Special Edition for 2018, this frame is engraved with a detailed shield on the presentation side and “With your shield or on it” on the lock side. • Overall Length: 8 13/16"